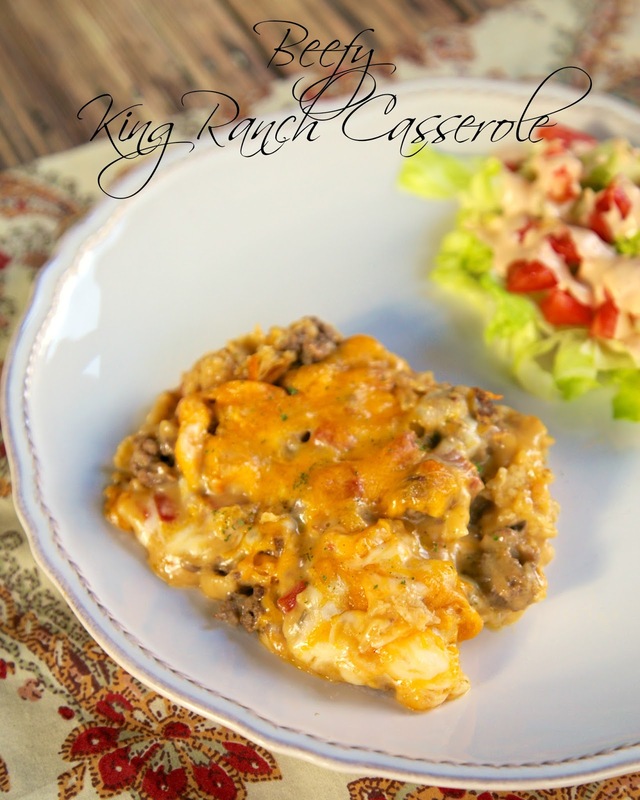 King Ranch Casserole is usually a chicken casserole. I wondered what it would taste like with ground beef instead of chicken. The answer? Delicious! Tortilla chips, Rotel, meat and cheese. How could it be anything but delicious? 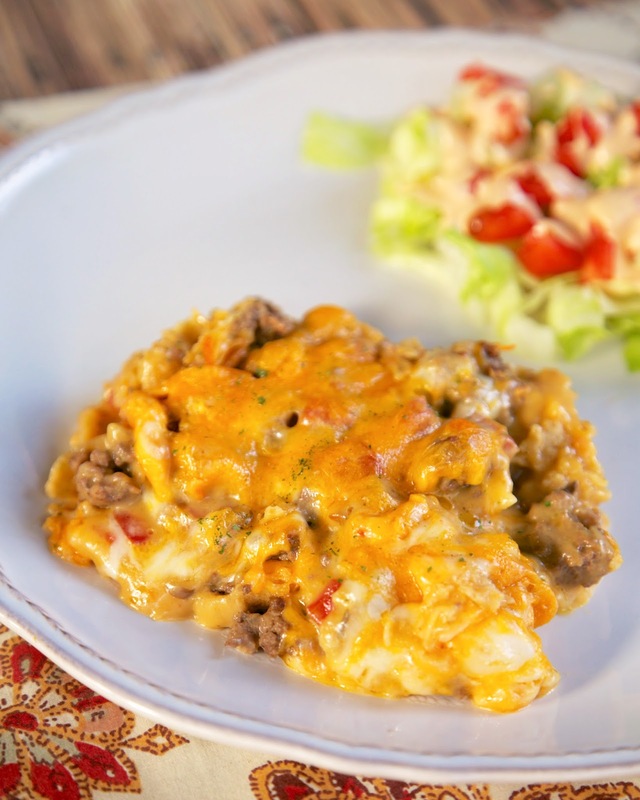 I used my original King Ranch Casserole recipe and just substituted taco meat. The casserole isn't fancy or healthy. It is just one of the best things you will eat. This makes enough for 6-8 people. I like to divide the casserole into two dishes and freeze one for later. Serve this with a simple salad for a quick meal. In a large skillet, cook ground beef until no longer pink. Drain fat. Stir in taco seasoning and water. Simmer for 5-10 minutes, until water is almost all absorbed. In a saucepan over medium heat, mix the soups, onion, tomatoes, Cheez Whiz, Tabasco and Worcestershire Sauce until blended. Add salt and pepper to taste. Remove from heat and set aside. Line the bottom of a casserole dish with enough crushed tortilla chips to cover dish. Place half the taco meat on top of chips, and pour half of the Rotel mixture over meat. Top with half of the cheddar cheese. Repeat the process, topping with remaining cheddar and all of the mozzarella. Bake for 35-45 minutes, until bubbly. Looks delicious - I've been going to try King Ranch Casserole for years but just don't get around to it. I was hesitant about going to the store this morning to get all these ingredients for one dish but boy am I happy I did. I just finished eating it and it was absolutely amazing. All of the ingredients work really well together. Can I leave out the chez whiz??. Where in a grocery store do I find it?? Cheese Whiz is always in the refrigerated Dairy section in my stores. Have you ever done a post about tips for freezing meals? I would love to-and have tried with not so great results. Casseroles always make too much for our family of four. Do you think I could substitute Velveeta for the Cheez Whiz? You like Velveeta then yes you absolutely can. I keep Velveeta on hand and I would not hesitate to substitute. Very good and very easy. It makes a lot! Nice change from chicken Steph, thank you!! This was so good I could eat it every day! This is so good I could eat it every day! 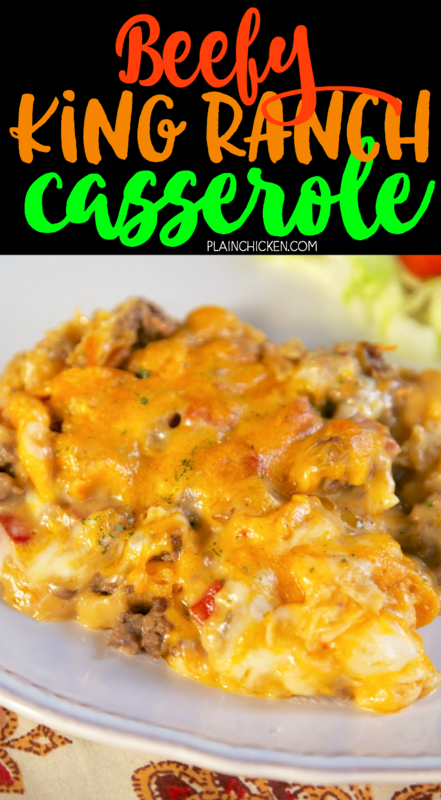 I love chicken king ranch casserole so I can't wait to try it with beef!!! So good! I bought freshly made tortilla chips and used Velveeta instead of Cheese Whiz. Outstanding!! !